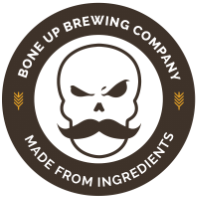 Stats: Comet Bomb - Bone Up Brewing Co. Cheese Pairing: Shredded mozzarella straight from the bag. Food Pairing: Palacsinta with hella butter and sour cream. Or clam chowder. But maybe not both at once. Music Pairing (Jared's Choice): "Barbara Ann" by the Beach Boys. Best Occasion to Drink: While you're hiding from the outside world. Brewers' Notes: Despite all the things that are his fault, we made this beer in order to make Ben's life easier. More to the point, we had a hankerin' to brew another single-hop pale around here, and it's a damn crime that we ain't focused on Comet yet. Comet's an old-school hop (as is our style around here) and it's thought to be partly descended* from wild American hops, which we think is pretty much the coolest. And on top of all that (not to mention its longstanding history in old-school American brewing), it's delicious as all heck, so we grabbed up a whole shitload and threw it in this beer and now you can drink some! * We've mentioned this before, but hop genetics is bonkers. Hop varieties have the craziest family trees.